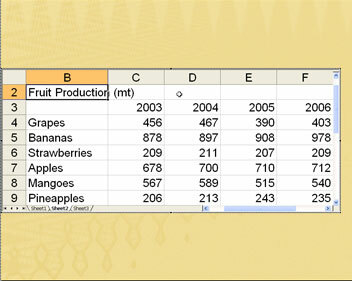 PowerPoint allows to work with text and figures created in another application like Microsoft Excel. Many users just like to place an instance of the Excel sheet inside the PowerPoint slide since this avoids link problems, missing files, and any other similar problem. Fortunately, you can embed an entire Excel sheet in a PowerPoint slide -- this gives you the best of both worlds because although your Excel sheet stays within PowerPoint, you can still use Excel's editing tools and formulae to work with the figures. Needless to add, all changes made to the Excel sheet (spreadsheet) show up on your slide(s). We'll show you how you can do this in this tutorial. But that's not the whole story -- many users just place a bare-bones Excel sheet on their slides with no consideration to integrating the look of the Excel component with the look of the presentation. We'll show you how you can make them look better too. 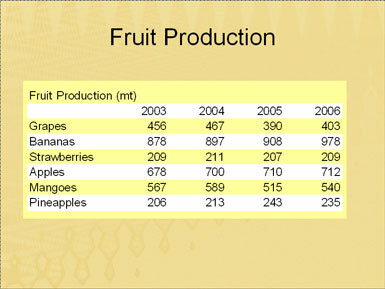 In Microsoft Excel, create a spreadsheet with any content, for this tutorial We have created a fruit production table, as you can see in Figure 1. In PowerPoint, create a new presentation, or insert a blank slide in an existing presentation. Then choose Edit | Paste Special (see Figure 2). This will open Paste Special dialog box, as shown in Figure 3. In the Paste as list, choose Microsoft Office Excel Worksheet Object (or similar) and click OK. The pasted text in the Excel content may not be visible, or it might not be large enough in size, or maybe you just want to format it to look better. 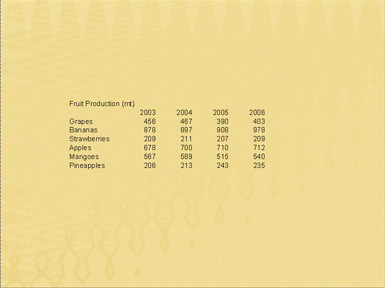 Select the chart and use bounding box (with the herringbone pattern) to scale it so that the text will be more visible. To do more edits, double-click the Excel content so that PowerPoint's toolbars metamorphose to Excel's toolbars. Also, you can see the content within an Excel interface -- notice the column and row headers, and the spreadsheet tabs in Figure 5. Note: Double clicking the content in PowerPoint opens the embedded spreadsheet with all the Excel options. Use options like fill color to give a background color to the table, adjust the bounding box properly so that extra columns and rows won't be visible. 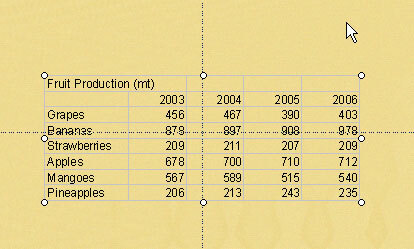 Format the font size as required, and increase or decrease the thickness of the lines that form the cell borders. After all the formatting is done, click anywhere on the slide to get back to the PowerPoint slide. If you want to format further, double-click the Excel content to format more as required. Repeat the process until you are happy with the result.